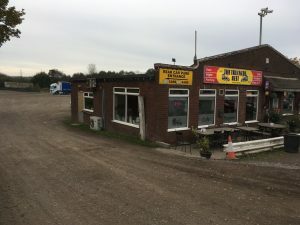 The Trucker’s Rest is a family-run, real ‘old school’, or ‘proper’, transport café. It’s on the busy A5 trunk road in Cannock, Staffordshire, just a short distance from junctions 11 and 12 of the M6. Sure it’s not going to win many awards for looks, but the food is excellent, very reasonably priced, the staff are helpful, and you only have to see how busy it is to realise this is a good place for lorry drivers. Feedback from drivers seems to suggest it’s a popular stop off point as well. There is a range of breakfasts, which are served all day, to suit all appetites. They start with the small breakfast which comprises two rashers of bacon, a sausage, a slice of fried bread, a fried egg, a choice of beans or tomatoes and this costs £3.10. The medium breakfast is the same but with the addition of a second sausage and both tomatoes and beans and costs £3.95. The large breakfast is two bacon rashers, two sausages, black pudding, hash browns, mushrooms, fried bread, tomatoes, egg and beans, as well as a mug of tea or coffee and is priced at £5.95. For those who really have a big appetite, then there is the Super large breakfast for £7.95 and that plate comes with three bacon rashers, three sausages, black pudding, two hash browns, mushrooms, fried bread, tomatoes, two eggs and beans, two rounds of toast and a brew. Finally, there is a veggie breakfast which is two hash browns, mushrooms, beans, tomatoes, egg, two rounds of toast, and a tea or coffee, and is priced at £5.45. You can add extras as well, with bacon, sausages, black pudding, beans, eggs, tomatoes all 70p a go, a beef burger will add £1.50 and chips adds £2. More bread and butter is 25p a slice, and extra toast is 35p a slice. For those not wanting a full English breakfast, then two slices of either beans, egg or cheese on toast is £2.20. Cereals are £1.20 each and a round of toast is just 50p. A mug of tea or coffee is just a pound but there is a selection of other teas, coffees and other drinks. Cappuccinos, lattes or expresso coffees are all £1.90 while Herbal teas are £1, a milky coffee is £1.40 and hot chocolate is £1.30. A simple bowl of soup, with bread and butter, is just £1.50 but there is also a range of salads, sandwiches and main meals. Chips with any two of bacon, egg, beans or sausages is £4.10 while bacon, egg, sausage and chips is £5.20. Faggots, peas and chips is priced at £4.65 while fish and chips, with peas, is £4.95. Corned beef and chips is £4.50. Other main meals include chicken breast, peas and chips at £4.85, gammon with egg, peas and chips is £5.45 while pie, chips and peas is £4.95. For those wanting something more substantial, then sirloin steak with chips and peas is £8.50 and a mixed grill is £7.95. There is a choice of roast dinners with beef, pork or turkey at £4.95 and chicken or braised steak at £5.45. The ever-popular liver and onions is £4.95. Salads are £4.95 and can come with a choice of ham, cheese, tuna, beef, pork, corned beef or quiche. 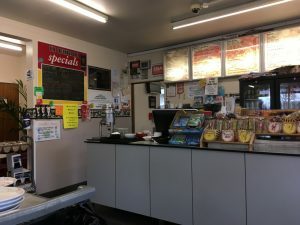 There is a range of jacket potatoes and they come with beans for £3.30, beans and cheese for £4, curry or chili for £4.20, cheese £3.50, tuna mayo £3.80 and just coleslaw at £3.30. Extras fillings are also available with cheese and coleslaw both 80p each, tuna an extra £1.70 and curry is £2.20. There is a range of hot and cold sandwiches as well, with the popular bacon sarnie at £1.60, and with egg, it’s £2.50. For desserts there are the old favourites, Apple pie and custard, homemade bread pudding and jam roly-poly all at £2.20. A slice of gateaux is £2.35 and tea cakes are £1.20. There is also ice cream, flapjacks, muffins and biscuits available. The Trucker’s rest features a fully-licensed bar. There are toilets inside and outside and drivers can have a free shower when they pay for overnight parking. There is also good washing facilities. 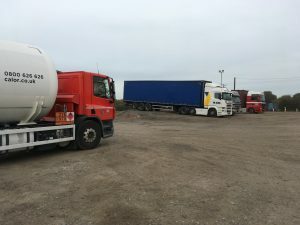 There is a huge parking area – with spaces behind and in front of the café – that can accommodate up to 110 trucks of an evening. Secure parking is free for the first two hours while overnight parking is £14 or £20 with £6 meal voucher. The site also accepts SNAP accounts and DKV fuel cards. The site is open from 0530-2230 on Mondays through to Fridays while on Saturdays it is open from 0530-1530 and on Sundays from 0700-1730. Overall this is a good place. It’s ambience is real old school which many drivers like. 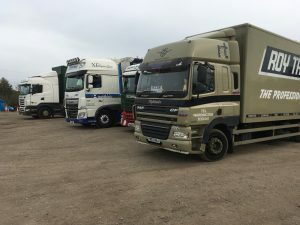 We enjoyed our visit and as it’s in an area where there is quite a bit of competition from several other truckstops locally, the Trucker’s Rest proves it is ‘on the ball’.